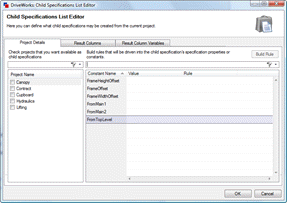 Projects are applied in the Child Specification List editor. The Child Specification Lists reads information from the Projects that can be specified from it, you will see a helper link (see below) requesting a refresh of the information from the Projects. Click the helper link to refresh the information. Click in the Projects property for the Child Specification List Control. The Project Details tab allows the Projects that are to be specified from the child specification list control to be selected. Launch the Child Specification List Editor by clicking in the Projects property for the Child Specification List Control. The filter box immediately above the Project Name and Constants list allow each to be filtered. This is very useful if you have many Projects with many Constants. Please see How To: Use Filters for more information. The Project Details tab also allows information to be passed into Constants, in the Child Projects, from the Project the Child Specification List Control has been added to. Highlight the Project from the Project Name list. Repeat for all Projects that can be specified as children. The image above shows a rule assigned to the Constant retrieved from the Child Project. The rule is applied by clicking the Build button with the Constant selected. Once all Constants have been retrieved from the Child Project, rules can be built for the Constants created for information being passed from the Parent Project. This will launch the Rule Builder where the information to be passed down can be entered or the rule built. Name - Retrieves the name of the Specification that has been added to the Control during run time. Type - Retrieves the Project type the Specification was created from. State - Retrieves the current state of the Child Specification as determined in the Specification Flow for the Child Project. The visibility of the Name, State and Type columns can be turned off in the (Name, State and Type) Column Visible property. When the Result Column Name matches the name of a Specification Property in the Child Project, the value can be automatically retrieved. See To pair a value in the project to a result column below. 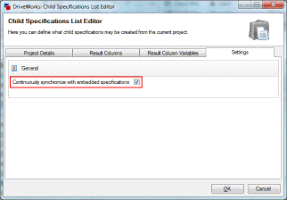 Select the Result Columns tab from the Child Specification List editor. Enter the name for the column in the Add Column field. Select the name of the column from the Current Columns list. Click Move Up or Move Down as appropriate to re-order. The Result Column Values tab is where the values in each Child Project, are matched to the Result Columns created. Variables or Specification Properties in the Child Project are passed to the Child Specification List Control by this mechanism. Select the Result Column Values tab from the Child Specification List editor. Select the project from the Projects list. In the Results Column list double click in the Output Name column, next to the Result Column name that the variable result is to be passed into. 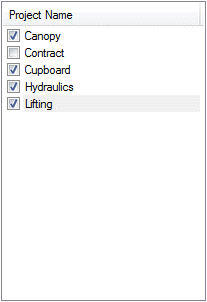 This will read all available values from the selected project into a drop down box. Select the value from the drop down list. Setting the Output Name to be (Auto) will match Result Column names with Specification Properties in the child project and automatically retrieve the value. If more than one Project can be specified from the Child Specification List Control repeat steps 2 to 5 for each Project. Embedded Child Specifications, which are only supported in DriveWorks Projects, can now be constantly synchronized with their Parent. This means that any Constants being set by its Parent (via rules in the Parent) are updated instantly, regardless of how many levels deep the Child Specification is. Earlier versions of DriveWorks required each Child Specification to be opened in turn to apply any updates, this happens because synchronized Child Specifications are opened when the Parent is opened. With Embedded Child Specifications, the instant you open the Root Specification, all Child Specifications that are synchronized will be efficiently opened in the background as well. The setting for this is at a Child Specification Control level, so on a list by list basis, you can say if the Child Specifications should synchronize all the time. An example for the use of this is when a top level Project has a particular option that changes what Child Specifications do or return. Such as something that will change the total cost of the entire Specification. Normally, you would have to open each affected Child Specification so that the Constant values are sent into them. With synchronized Embedded Child Specifications, this is now automatic. When you enable synchronized Specifications, the Project Setting to enable embedded Specifications must also be enabled. 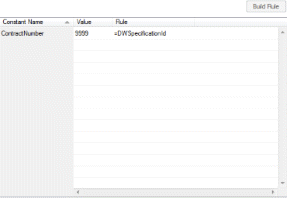 DriveWorks Projects (Not Excel Projects) that contain one or more Child specification controls can now have each child specification embedded within its parent. An embedded specification is directly stored within its parent. They are not registered to the Group whatsoever. The only thing that knows about and controls the child specification is its parent specification. Embedded specifications are assigned globally unique specification identifiers, so there will never be a conflict of specification identifiers. Documents and reports will be registered against the “root” (topmost) specification. This is done because the root specification is the only one that will be visible to the outside world and to the group. Selecting the root specification in the specification explorer will show all child reports and documents. This means all relative folder paths will be relative to the root specification too. This is, again, because documents are registered to the root specification. Automatic states will not work on embedded child specifications, as Autopilot can not see the projects, but the topmost specification can still be put in an automatic state and released which will cause it and all of its children to release. Emails will work though, as they are registered against the root specification. Copying a child specification will now also copy all its children. This is a direct benefit from having the child specifications stored in their parent. Move or copy the parent and you are moving or copying the children too. All children will be given new specification identifiers, as well. Deleting a child specification will also delete its children too. The setting for embedding child specifications is a project level setting. Meaning all child specification controls in the project will embed specifications. This is so the behaviour is the same across the specification. This is turned on by default for new projects. A way of completing a Child Specification, pulling data inputted in the Parent Specification, without needing to open the Child. DriveWorks Tech Tips Portal is available to DriveWorks Pro customers with an active subscription and support contract. Tech Tips provide cut down projects that highlight specific functionality for faster and more effective learning. The portal provides a search facility, start typing the name of the Tech Tip (as indicated above) to display the Tip you require.